During a shopping trip, bahn mi were purchased for enjoyment at lunch. An excellent bahn mi, although a little pricy at $8.50 each with tax and tip. In fairness, it’s a big serving. We’ve eaten very well during September and one of the meals from earlier in the month was worth repeating: smoked salmon cobb salad. This was still an excellent salad. Add 20c for shredded arugula. This is a great variation on a Cobb, and the feta was the right choice. A great mixture of salty, fresh, creamy and egg for $6.11 per serve. Today’s sandwiches were a mix of village bread (corned beef) and toasted rye for the cheddar and apple. We melted the cheddar and it mixed with the apple much better. The sandwiches were split and shared. Today’s sandwiches were returning favorites for a good reason: they’re great and just $2.44 per serve. Thursday night is traditionally our steak (or other meat focus) night and tonight we grilled a rib eye. Greg was inspired by the blue cheese and endive we had at Dos, but used Nigella Lawson’s rocomoule recipe: avocado and blue cheese. Tonight we went with a creamy blue castello and two ripe avocados. It was very good. 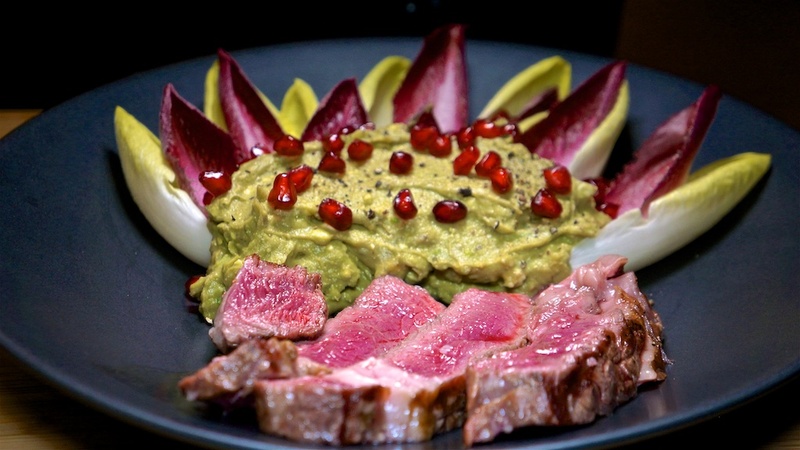 The rocomoule is amazing and the bitter endive is a perfect balance. The pomegranate adds 20c per serve. Definitely not a cheap meal at $14.99 (possibly our most expensive at home meal since we started this blog) but a very tasty one. The steak was fully flavored and cooked blue (as we like it) and the rocomoule and endive as a perfectly balanced accompaniment. We were at a seminar where a boxed lunch was provided, which included a club sub, chips and water. It was included in the seminar package. Our monthly LACPUG meeting leads to pizza where we all contribute $5.00 per person. More sandwich combinations on village bread (a dense grain bread we enjoyed a lot in Amsterdam). Today apple and caramelized onion cheddar, and a repeat of the corned beef and spicy labné sandwiches. The sandwiches were split and shared. Today’s sandwiches were returning favorites for a good reason: they’re great and just $2.53 per serve. A friend invited us out for Thai food at Krua Thai and paid for the meal. We enjoyed Tom Ka Gai, eggplant with ground pork, stuffed chicken wings, and duck on rice. All were great. A Burbank day for Foodie Philip who had the usual Double Double Animal Style at In and Out Burger, for $4.26. We had a do-over of last night’s pot roast for $7.06 per serve. Now that we’re home from traveling, it’s back to making our own lunch. Today we went simple and did corned beef and spicy labné on village (dense) bread. Lunch today was $1.89 per sandwich. As we had a chuck roast, the obvious meal is a pot roast. 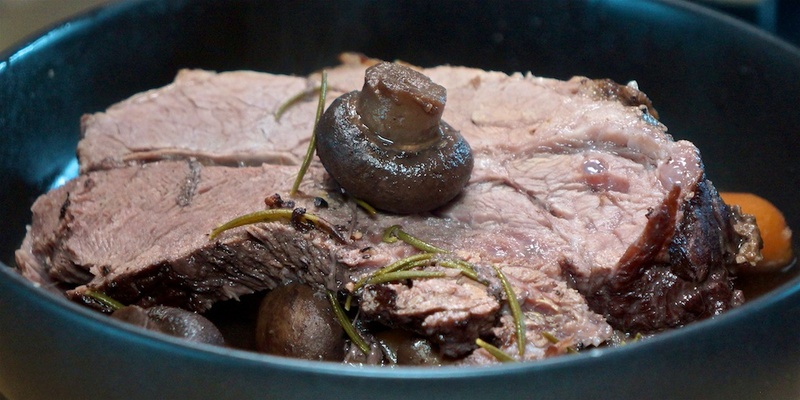 Slow cooked until tender, the perfect pot roast recipe has a lot of flavor, particularly when you ramp up the amount of mushroom in the recipe. Unlike Pioneer Woman, we cook the potatoes in the flavorsome liquid. Dinner tonight cost $7.06 for a hearty, warming meal. Before heading to the aircraft for our trip home from Amsterdam, we stopped for a ham and cheese croissant. Approximately $7.15 per serve! Well, it was an airport. We had two “other lunches” on board the flight home. Some decent chicken stew with rice, coleslaw and the world’s sweetest profiteroles, and our other meal was the most boring piece of “pizza” ever served. Fortunately we didn’t pay directly for these meals. We were back home for dinner and not wanting anything too heavy, so Foodie Greg picked up some Thai Shrimp Gyoza and organic chicken broth from Trader Joe’s. 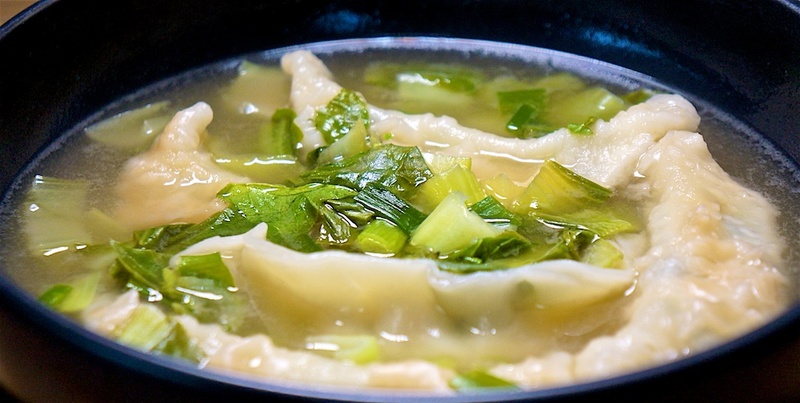 Heat the gyoza in the chicken broth with some bok choy and a nutritious and tasty meal was on the table quite quickly. The gyoza were quite lightly flavored but tasty and with good texture. The bok choy was $1.99 or 33c per serve. Dinner tonight was quick, tasty and nutritious for $2.33 per serve. We took an early train the Haarlem, and sadly experienced Haarlem in the rain again. After exploring the city for a couple of hours, we headed back to Amsterdam and Rembrandtplein for another Filet Américaine at van Dobben. Aproximately $5.40 per serve. Our final dinner in Amsterdam and an opportunity to return to a restaurant, or find something new. As there were unexplored entries on the Dos menu, it was close by and we liked the local ambience we went back. Tonight it was a little later and the light was not good for photos, but we enjoyed three different dishes. The roasted garlic mushrooms was good with plenty of garlic flavor, but we decided that Greg’s version with butter is better. We finally had an opportunity to try the ropa vieja – a beef and vegetable beef stew with origins in Indonesia, as it was out at Jottum last night. It was exactly what a warming beef stew should be like. And for a fish dish, we had fried calamari, which was also as perfectly floured and fried with just the right bite and tenderness. All up, the food cost about $13.45 per serve. Worth every penny. As we were out walking, we did the total tourist thing and stop in for rib eye at an Argentinian steakhouse, just off Dam Square. It was competent all round, although the sauces lacked a lot of flavor. We returned tonhave a full meal at Jottum, as we enjoyed our last minute, on the way home, meal there last year. We chose four dishes, which seems to be enough for us. 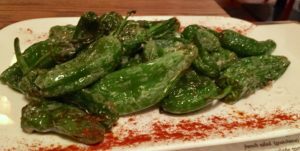 First out were the padron peppers. Although there are random hot ones, we had only mild on this plate. Next out was the lamb sausage with yoghurt dressing and a little tabouli. They had good flavour, and the texture was perfect. 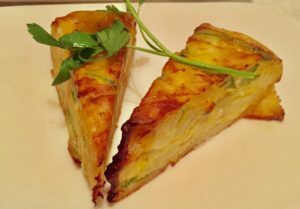 We couldn’t have Tapas without tortilla, the Spanish kind made from potato. This was a particularly good example. We also had a scallop each, but there’s no photo! All in the meal cost approx $16.67 per serve. Although Jottum was good, we think Dos takes the lead for local tapas. Out for a walk around Centrum, we stopped for pannekoeken: Dutch pancakes. 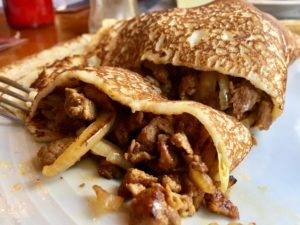 Greg had a bacon, onion and cheese, while Philip got a huge surprise with his schwarma pancake! A full schwarma wrapped in a pancake. Lunch today was approximately $11.90 per serve. 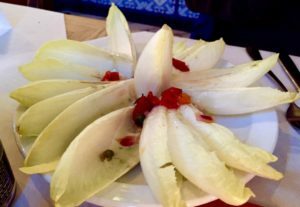 For dinner we decided to revisit a neighborhood tapas place – Dos – where we had enjoyed a great meal last year. They did not disappoint. 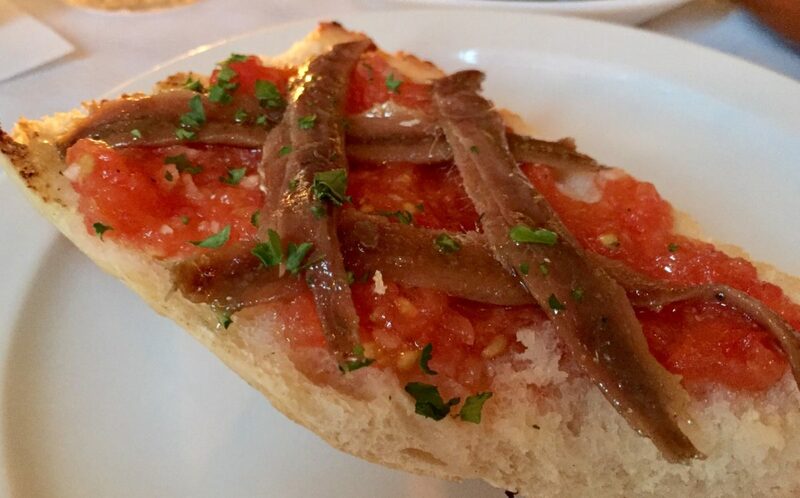 Starting with the tomato bread with anchovy featured in the cover photo, through three more great dishes. 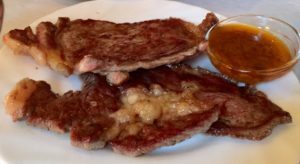 The rib eye was perfectly cooked and full of flavor, largely because there was fat on the meat. 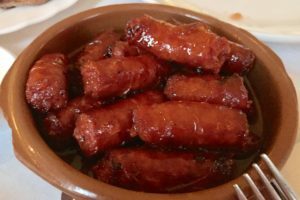 The cherizo sausage was simply fried off, but was delicious and proper sausage not the loose version common in Mexican food. The hit of the meal was definitely the endive and blue cheese. Yum. The bitterness and wetness of the endive is a perfect balance totblue cheese dressing. With a bottle of wine the total was 50 Euro, or without wine, about $17.00 per person.